Hi. This is my first full AAR. I will probably bungle it badly. I'm a relative beginner to PON, though I have played it some and have played other AGEOD games much more, including full games of Civil War II. I'm from Louisiana in the USA, born here, live here now, GEAUX LSU TIGERS and all that. I had a long military career though including five years spent in Germany in the 70s and 80s, two tours with the US 8th Infantry Division. For the last 24 years I have been a high school English teacher. So you will see both the Army officer and English teacher come out in my writing as I continue. Why PON and why an AAR? To quote what I told Loki in a recent discussion about the status of the game in another thread: "I became interested in an America campaign after reading here about the updates and changes to the game and after recently reading Empire of the Summer Moon: Quanah Parker and the Rise and Fall of the Comanches, the Most Powerful Indian Tribe in American History, by S. C. Gwynne, which describes the long but ultimately futile resistance by the Comanches to United States (and Mexican) encroachment on their lands. Of course I note in the game that Comanche land is generically described as Cherokee land, as the game uses a few Native American tribal names to substitute for the many historical tribal groups. But I am interested, among other things, in how America in the game deals with the Native Americans." I should add that I have a lot more than Native Americans to focus on in the game. But that will be a special interest to me. Why the title? "Stars Fell on Alabama" is the title of a 1934 jazz standard. The slogan was on Alabama license plates earlier this century. The title apparently originates with a 1934 book of the same name by Alabama writer Carl Carmer about his travels in Alabama, and it refers to the 1833 Leonid meteor shower, which apparently was quite spectacular and occurred on totally clear nights, sparking numerous newspaper stories in Alabama that year. It appears to have had a profound effect on many of the people who saw it. But that doesn't fully answer the question. My father's family is from Alabama and lived in Alabama during the entire period in which PON takes place, 1850-1920. My wife and I have done a good deal of geneological research in the last few years on both our families, and about 25 years ago my oldest brother and I and our wives visited the area of Alabama in which my family lived during that period. So I'm going to use my ancestors as a focal point for the AAR, starting with my great great grandfather John W______. He and his father were living in Alabama in 1850, but his father Isaac was older, and John had a very interesting life during the time frame of the game. I know a good many basic facts about John's life. I don't know what he thought about things in most cases, though I can infer what he thought about some things from some of the events in his life. So in the AAR most of the facts that I mention about his life are things that are documented in some way. In most cases when I write about what he was thinking, I'm just guessing. And what he thinks about the things that will happen in the game will be even more of a guess. I am playing with basically normal settings, no expanded settings, with just a few tweaks, like slight randomization of general ratings. I am playing with historical SOI and no extended pool or structure pool. My AAR will not be extremely detailed. I'm not really a numbers cruncher. I will do what I think is the minimum to keep my economy going. That is probably a bad idea. I have no grandiose plans for conquest. I am going to try to get the US to roughly were it was in 1920. So I will give you a narrative AAR with some screen shots but not a lot of economic number crunching. There is no America AAR as far as I know. I have read some strategy suggestions for playing as America, but I have not read too much detail. One big suggestion is to fortify Washington in preparation for the Civil War. Since I know the Civil War is coming that makes sense. That is not historical. Washington was virtually defenseless at the start of the war. But from a gaming standpoint, since the war is hard coded, I will fortify. Another is to build some cavalry units to deal with the Indians. This is actually somewhat historical. In 1850 the US was just coming into extensive contact and conflict with the Plains Indians, masters of warfare on horseback. All previous conflicts with Indians had been with eastern Indians who lived in forested land and fought mainly on foot. But the plains Indians on horseback were an entirely different challenge. The US (actually the Texans and then the US) learned that they had to fight these Indians with well trained troops on horseback to have any chance of success. Thus the cavalry units. Overall through I want to try to deal with the Native American peacefully. I also wanted to get this post and my next one written because it will commit me to this AAR. Now I may crash and burn. I will probably bungle it badly. But I will enjoy it and will tell you about it, the good and the bad. My primary hobbies are reading and gaming. As an American teacher I'm off for about two months now. I will be able to make a good start of things during that period. I have no long trips planned, just overnight trips to see a concert by Garth Brooks this month and Paul McCartney, who by some miracle is giving a concert in Shreveport, LA in July. After that things may slow down some, but I do intend to do this. I've been playing a series of games of Distant Worlds Universe until now, if you want to know what I've been up to in gaming. Okay, my next post will start the AAR. Let me click submit and commit myself. John W______ sat back on the porch of his farmhouse in the hills of northern Alabama and thought about his life. 25 years old. Married for one year to the beautiful Virginia, one year younger than him. Owner of 100 acres of farmland next to his prominent father-in-law's 400 acres, owner of a handful of slaves, and part owner of his father's store in town. Life was good. There had been a party earlier at his father-in-law's house, not as big as the huge wedding party last year that people still talked about, but still big. Now it was evening and he was back home. It was cold outside, but he liked the cold and sat looking at the stars over the Alabama hills and listening to the calls of the night birds in the woods. He thought back on his past as he lounged on his porch. His father Isaac, an Alabama state representative in the 40s, a store owner and postmaster and farmer. A veteran of the Indian wars, such as they were in the Southeast. Born in South Carolina. He had moved first to Georgia onto former Indian land and then to Alabama. John had been born in Georgia. And his grandfather, Benjamin, born in North Carolina, a Revolutionary War veteran. John didn't know much about his family history before that except that he had been told the family came over from England to Pennsylvania and then moved southward. liked to tell the story. He wondered for a moment if he would ever fight in a battle. But America and Alabama were rather peaceful in early 1850. The Indians in the Southeast had been forcibly removed west more than ten years earlier. The Mexican War had ended two years ago, a great victory for America that had gained a huge swatch of land for the nation. There were skirmishes with Indians in the West, along the frontier, but America was at peace. American was spreading across the continent, and it seemed to be the nation's Manifest Destiny to do so. Of course there was the slavery question, but men in Washington were trying to come to grips with that. The big argument was over how to handle slavery in the territories won from Mexico and maintain a balance between slave and free states. John wondered how that would work out, but he figured that just as in the past, surely Congress would come to some sort of compromise. Sure, some Southerners were talking about secession if a compromise wasn't reached, but that was just people blowing off steam. Surely it would never come to that, even if hotheads like William Yancey of Birmingham with his Alabama Platform, were advocated resistance to any further restrictions on slavery. But then slavery was a somewhat distant thing to John. There just weren't many slaves in the hills of northern Alabama. He owned half a dozen slaves, his father-in-law a few more, but they were treated well, almost like family. Okay, not almost like family. That would be a lie. But not like the slaves on the big plantations in the low country. His slaves were a couple of families who lived on his farm and worked with him and often beside him. He had visited one of those plantations once, owned by a cousin who owned more than 100 slaves. It was like another world there, an ugly world, and he knew his own slaves talked with fear about being sold to a big plantation. In fact it was one of the things that made managing them rather easy for him. John just figured things would stay the way they were after all the talk in Washington was over. President Zachary Taylor, inaugurated in March 1949, was a Southerner. Alabama had voted for Taylor. And Taylor himself favored compromise on the slavery issue and threatened secessionists with military action. Surely people like Taylor and senators Henry Clay and Stephen Douglas would work something out. There were other things going on in the world. John had read things about them in the paper but didn't think too much about them. Taylor had expressed support for the 1848 revolutionaries in Germany and Hungary. There was a little dispute between Spain and the US over Cuba about some filibuster from Venezuela who was trying to stir things up, but Taylor was strong against filibusters. And Taylor had signed some treaty with Britain about Nicaragua and a canal connecting the Pacific and Atlantic oceans. It appears the British wanted control of that canal if it was ever built. Why did the British want to keep meddling in affairs here in the Americas? Just four years earlier there had been talks about war over the border of Oregon of all things, but that had been settled by another compromise. Why couldn't they just leave us alone? After all, we were mostly family. It was like the father squabbling with his adult child who wanted to live his own life. And there was that gold rush that had started in 48 in California. It was drawing all kind of people to California and other points west, including a couple of John's cousins. But here in the hills of northern Alabama, things were peaceful. A new decade was dawning. Half of the 19th Century was over. John rose to go inside. Just before he turned away from the hills a bright meteor streaked overhead and disappeared over a hill. John thought back to the night stars fell on Alabama in 1833. He was eight years old, but he still remembered the two nights vividly. His father had taken him out to watch for a long time one night. His mother had stayed inside praying. Like the Cherokee, though, John considered the meteor to be a good omen. John turned and went inside to be with his pregnant wife. He would be a father before July 4. Life really was good. great stuff. Do agree with the 'write and post something so you are committed' mindset. It tends to get you over the biggest hurdle which is starting and then its interesting to see how things start to develop organically as the game and your posts interact. Its not from PoN but the original Victoria (by Paradox) - genuinely terrible game with odd mechanics but it did spawn some superb AARs - but you might want to check out the Director's A Special Providence. Its a USA centred AAR but what is useful is the way he manages to integrate posts from specific points of view and more general narrative updates. As to economic management, I've found with the bigger states its far easier. With Italy I spent a couple of years setting up a very precise pattern of production and trades and then had to redo this several times. With Russia I slowly fiddled with tax and trade to get a reasonable flow of private and state capital and more or less leave it to run itself. A starting note. I am going to stumble and make a lot of mistakes. Veterans are welcome to chuckle at the mistakes. Advice is welcome. One request, though, just for my enjoyment. I know some things are scripted. I know the Civil War will happen. I imagine there are other scripted events or events likely to happen. DON'T TELL ME. Let me stumble upon them myself. I'm not necessarily looking to beat the game but to enjoy it, and stumbling upon scripted items will be part of the enjoyment. Otherwise, like I said, advice is welcome. Here is the starting situation as I see it. The USA strategy guide in the manual gives me a general roadmap for my game: "Except for an inevitable and normally readily winnable though costly civil war (above all, make sure in the 1850s that the capital is well-fortified and defended), the United States will spend almost all of the 19th Century focused on economic growth in the east and a continual process of Indian wars, settlement, and development in its vast western wilderness that is represented primarily through Colonial Action cards." I also expect some dealings with Spain at some later point and with other European powers and possibly an entanglement in a general European war near the end of the game. But that is for later. Right now I am focused on 1850. With that in mind, here is my first look at the map. Geographically the US is shown as divided into the 48 continental states, though in 1850 the borders of some of the western states were not actually determined. There are large areas of the Midwest and Southwest over which the US does not have military control and which are given the status ranging from protectorate to colony. Of course colonization of these areas is streamlined somehow, which apparently makes it an easier process. I don't fully understand colonization and how it will work for the US. I have only played the colonial game a little in previous uncompleted games as other powers. I will be winging it to some extent. But I know it is a slow process, so I also have some time. I also have a clue from the manual: "Kansas, Washington and Oregon Territories start as Formal Colonies (think in terms of having a formally organized Territorial government), and the other future states are all Protectorates. Minnesota can be made a Colony immediately." The rest of the US strategy guide gives more detailed advice about colonizing the future states. I will read that carefully. Military forces are scattered. Many are locked in fortifications. There are no large field armies. The largest mobile forces are of brigade size, mainly arrayed on the western frontier against the Indians and at the border with Mexico. No units are under production. I note the strategy guide suggests "...mobile forces of cavalry and horse artillery under capable leaders..." for dealing with potentially hostile Indians. However, the US merchant fleet has a worldwide presence, with merchant fleets in ten maritime trade boxes around the world. 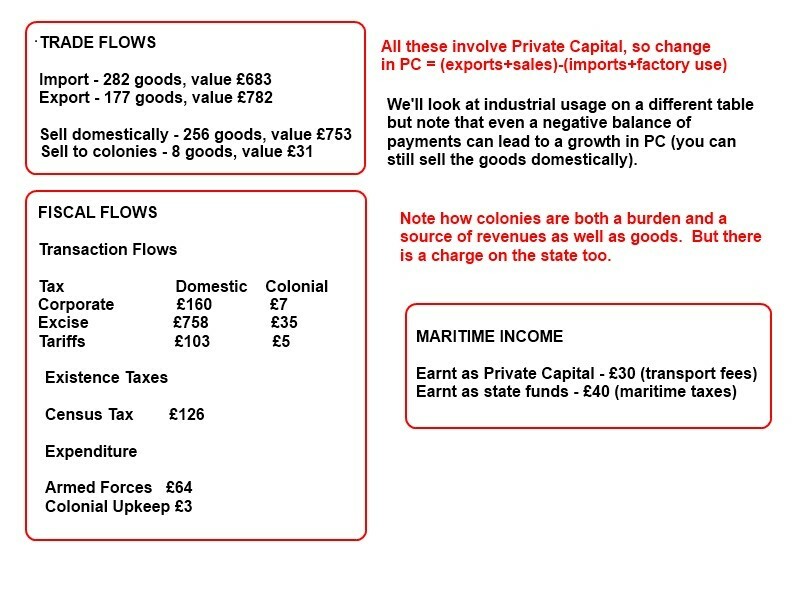 A look at industry and commerce shows both money and private capital projecting a loss, money from 300 to 294 and private capital from 1400 to 1296. The major organic rescoure is cotton/wool, which would represent primarily cotton, at 100, with a projected balance of 113. The most serious potential loss is tobacco, from 50 to 31. Do my people really need tobacco? I guess so. John likes cigars. Coal is the largest inorganic resource, projecting a gain from 200 to 205. Both manufactured goods and iron project small losses. Mechanical parts is a small part of the picture, but it projects a large gain. There are no loans and no inflation. Average population satisfaction if 50%. The total of all resources and goods is 4079. There are several recommendations for resources needed and production to be built. I will look over those again when I start my game. In the regional census there is a long list of colonial regions shown, but most are within the continental US. Of note, regions outside the US shown are Guam, Samoa, Hawaii, and regions of Cuba. Research. I've got to read up on research again. It is probably the area I understand least. A little advice on research would be welcome. In colonial affairs, I learn that our largest single prestige gain can come from Alaska, 75 points. So I will need to develop an Alaska plan. If Alaska is scripted event that just happens, don't tell me. This is followed by Philippines, 45 points. We have competition from Russia in Alaska and Spain in Philippines. There are numerous continental US areas where we can gain prestige, and then Cuba and even Zaire. I imagine I will ignore Zaire. Diplomatically we have good relations with Britain, 40, France, 25, and the Cherokee nation, 25. We have bad relations with no one. We have several treaties, all dealing with supply. We are at war with no one. We have 600 prestige points, which puts us behind Britain, France, Austria, Prussia, and Russia, in that order. John's home region of North Alabama has no town of any size and no development. It has a resource, minerals, unlike the rest of Alabama, which has cotton in all other regions and iron in one. North Alabama is the least populated district in the state with the smallest urban population. Its population is 55% Dixie, 25% African American, the lowest percent in the state. All the African American population is enslaved. I will probably give a little extra attention to developing North Alabama, though historically in the game period it is the iron-producing region that developed most rapidly. I am just going to concentrate on a few short term items as I get the game started. I will try to take some modest actions to get my money and private capital into the green first. Next is to begin the process of turning the colonial areas into states. I know that will take a long time, but then I also know historically Minnesota was admitted as a state in 1858 and Oregon in 1859. So I will look there first, especially with the clue from the manual regarding Minnesota, and see what I can do without spending too much too fast. I also want to look at building some cavalry units as recommended by the strategy guide. Finally, I need to start considering economic development and fortifying Washington DC in preparation for the Civil War. I won't do all those things at once. I will start with an economic tweak and go from there. Next up will be a summary report on 1850. That will probably be a couple of days. I am traveling to a concert (Garth Brook) tomorrow and will be gone a couple of days. And I want my summaries to be shorter than the things I have written so far. As a side note, the eye of what's left of a tropical storm is passing less than 100 miles west of me right now. It is an odd tropical storm. It has very widespread rain bands, extending all the way to Alabama, where it was raining on the graves of John (my great great grandfather) and his wife, and of my great grandfather and his wife earlier today. ( I know the cemetery where John and Virginia are buried, but the grave marker no longer exists. The marker for my great grandfather and great grandmother was not lost, and relatives in Alabama put up a new marker a few years ago. We all suspect John and Virginia are buried nearby.) And I have a niece there who was within 100 yards of a tornado in Alabama today. Here the weather has been spotty, with scattered showers, no heavy rain so far, and occasional light wind, with periods of sunshine mixed in. We still have a possibility of some heavy rain as the storm move off to the northeast. But this is not unusual for Louisiana. Research is actually pretty much out of your hands. This is a far better modelling of the realities of the situation in the 19C than games like Victoria which have mechanisms akin to the 20C state directed research. So in the main it happens. In effect, you'll see messages about discovering the principles of x ... this puts the technology on the list of the F8 screen. This is usually date limited but (I think) can reflect wider progress. All these then advance to completion. The rate seems to be determined by how well educated your overall population is and your national characteristics. When you get the university and school RGD cards they push up education and I noticed with Italy it made a real difference to speed of completion. By the 1890s I was completing each batch of techs as they came available with no residue from earlier blocks. In the main all advance at the same rate, both the ones you want and the ones that will cause you trouble. The only direct tool you have is to invest in a tech. If I recall this is £50 per turn per tech. That will increase the speed - but be careful till you have the economy stabilised. It can really drain your state tax revenues. You will also get lucky completions - I think this is essentially random but again may reflect that the other major powers now have that tech. Don't fuss too much about the at start contentment rates. As long as you don't tax too much early on, this will shift upwards quite quickly. Thanks for the comments on research. I actually had it right in my head but was convinced that I must be missing something important and obvious. I have what I think is one immediate and pressing question, though. I ran a couple of short practice runs over a couple of months, just looking at my economy. In one I tweaked trading to try to increase private capital. In the other I just let it run. I was able to increase private capital a little by tweaking, but frankly I didn't do much better than when I did nothing. State capital showed a slow but steady increase either way. But then this is over just 2-3 months. But my state funds are small and shrink at a steady rate. Here is how they look in one practice run doing nothing but hitting next turn over three months. Starting at 300 I get 297, 252, 214, 188, 217, 198. That isn't really enough to do anything, colonial actions, construction, anything. To me that looks like an immediate concern. I don't want to start a legit game and find myself immediately bankrupt. So what can I do there? My reading tells me raising taxes is about the only way to increase state funds. On the other hand I don't want to over react and do something drastic that will hurt me in the long run. So what are some recommendations to help me with state funds? Thanks. Meanwhile I am about to head out the door for a weekend in Cajun country in south Louisiana and a Garth Brooks concert. I will check back in a couple of days. I forget the exact set but the one that hits the rich is useful. Discontent in that social class is not that much of a problem. Then tariffs and the tax on shipping. This will harm some of your international relations but that is not an immediate issue - just keep an eye on your relations with GB and offer them access or whatever if it slips <0. Then, test out the main taxes. Get it so the entire package has you +ve over 6 months - some taxes are only collected every now and then. As you do this keep on an eye on the contentment changes. You'll see in the turn log that contentment in X has increased (or decreased) Y%. As long as you are seeing increases - or if the decreases are from 100-99 etc - then you might want to add a bit more tax. Don't build new units early on. If you can't pay their wages etc then you will start to take attrition and have to buy replacement chits - which cost money - etc. Your trade pattern will help too. In general, its better to buy than build, so look to close off some production where the goods are readily available. Trade will also offset any international grumbles over higher tariffs. If you buy you can levy both import and consumption taxes. I'm not sure this is that realistic but it seems to fit around the game design. Also as you adjust, make sure you have closed down any production that uses money as an input. At start I think this is just the shipyards - good for prestige but you can do without a couple of PP per turn for a year or so. EDIT: dug out some charts from Manufacturing Italy that might help - since the old index was broken by the forum upgrade no point trying to link. Loki, thank you very much for the detailed responses. I really appreciate them and hope other newer players read them and learn, too. In both the case of research and state funds, you confirmed that I had the right general idea but also gave me a great deal of additional needed information. My immediate goal now is to try to start the game by playing through a year without doing too much. If my funds appear relatively stable I will write a brief summary for the AAR and then continue playing from that point. Okay, I started and got through 1850, so I'm going forward with this game. Thanks again, Loki, for you kind and detailed answers to my questions. I have a couple more at the end of this AAR. Thanks to Loki and taxes, I got my economy growing without experiencing any shortages of any important product. And I started experimenting with colonial actions and other building projects in the second half of the year. I built or started building a couple of railroads, a tropical fruit farm in southern Florida, and a rum production plant in west Louisiana (actually it should be northeast Louisiana) so I could have access to a tradition of rum production in my home region 167 years later. This is a summary of 1850 in detail, but I don't intend to write annual summaries. Probably every five years unless something very important happens. I also have a couple of questions at the end. Jan. 1, 1851. John sat on his porch looking back on the year 1850. John followed news and politics closely. The store he owned with his father Isaac had the best selection of publications in the county, including the Montgomery Advertiser, the New York Times, the London Times, and that new general monthly Harper's Magazine. Of course it took time to get all these newspapers and magazines and others to a small town in north Alabama, especially with no rail connection to Alabama from the rest of the nation, though that was being planned, so some of his news was old. John sat back and thought about the year. Things had been good on his farm and in the store, and overall things had been good for the nation, though the slavery issue seemed to overshadow everything sometimes. Harper's Magazine had an interesting only halfway serious rating of the nation in its December issue which John had just read. The rating gave America a national morale of 100, whatever that meant, and a prestige rating of 1260, which ranked American fourth in the world among nations. It was the position of Harper's that America was a great power with unlimited potential that would eventually outgrow its older European brothers and all other nations. John wasn't sure how much that really mattered, but it was interesting to read. The economics report was very interesting. The nation's state funds had grown from 300 to 634 units in a year, and private capital from 1400 to 3177. Initially reluctant to spend, the government and the capitalists had started to let some of that money loose in the second half of the year. The government was building up its territories in the west, and Minnesota had gained formal territory (colony) status. There was talk of impending statehood for Minnesota and perhaps Oregon and Washington. The government was also building fortifications at Washington DC and southern Illinois. Some in the South were worried about that. And several mixed brigades of cavalry and infantry had been created to deal with the Indian threat. Two were on transports now bound for California and Oregon. Yet the Indians had been relatively peaceful except for the Nez Perce who had been raiding in eastern Oregon. Private capital was building railroads, and in December the rail line had reached St. Louis headed west. How far west, no one was sure, though dreamers talked about linking the Atlantic and Pacific oceans with rail. The telegraph was also spreading. John had read about numerous inventions and their possible impact on the future, so many that he had lost track. It seemed like nearly every paper carried the news of some new invention or development. The nation seems happy. Harper's said there was 53% satisfaction, though some populations and regions were upset about the tax increases that had occurred at the start of the year. They were said to be necessary so the government would not go bankrupt and would have enough money to get things done like spreading American civilization across the Great Plains. And after some tight times early in the year, things had started booming economically. America was selling many goods in a world market and bringing many back with its great merchant fleet. There were not real shortages of anything, though there had been a brief shortage of tobacco at the start of the year. Merchants were even importing opium, which was being used mainly in the form of laudanum, as a cure-all for just about everything. In his own store John had bottles for sale, along with other new items this year. John didn't read much about foreign affairs, but he knew enough to know that the US had no real enemies, though there were arguments with Spain about Cuba and Puerto Rico. And overall, the world seemed at peace. There were no major wars anywhere in the world at the end of 1850, though John had read about many European nations enacting conscription and wondered why that was necessary. It had been a good year, though the problem of a nation divided over slavery just seemed to be impossible to solve. John heard his infant daughter Bianca crying and his wife Virginia talking soothingly to her inside. He lit a cigar and sat on the porch watching the stars. I have large stockpiles of some items, like cotton, 215 units, and some other items. I finally decided I should start selling some of it and reducing that stock. I know I can look at the F4 window to see how much of an item I need to keep in stock. Is reducing the stockpile of some items a good idea? Are there any items that I should stockpile rather than selling down some? Like coal maybe? It is easy to make one click purchase orders for items using the B panel. But what is the easiest way to sell items? Apparently it is using the T panel after clicking in your capital region. Is that the easiest way? My usual view is if stockpiles are going up then close off some production - especially if its for a reasonably common good. Stocking up on coal (as an eg) in the early game is a good idea as that becomes very hard to access by trade by the mid-game. Even then, I'd put some production up for sale - just try to make sure that sales+usage is < production. Goods that I let run down are cotton, dyes, iron, fish. 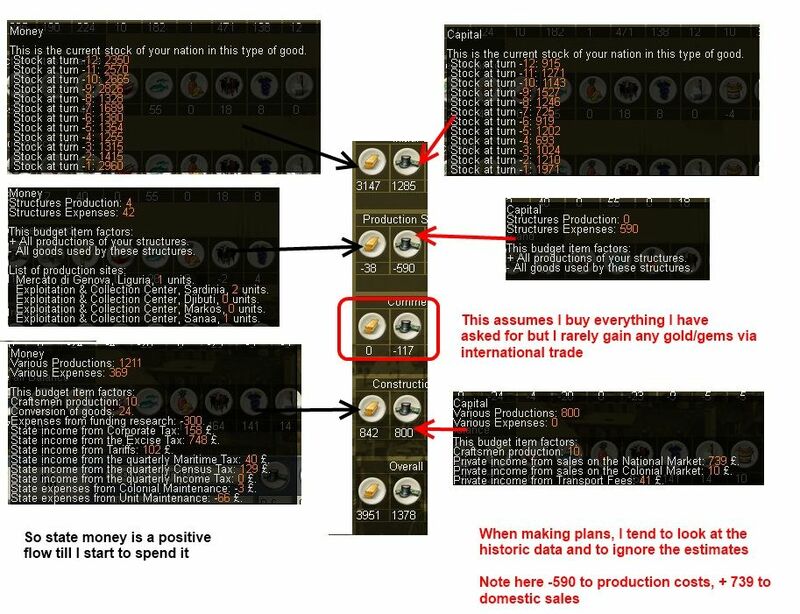 All early game are easy to access by trade or production so you can save the private capital. I suspect the games' economic model rather understates the importance of cotton in particular in this era. Yes, use the T screen to set up sales. You can aso use the T screen for your buying. This helps if you want to force overseas imports (= taxes from shipping), less use for the US of course, and/or be nice to some countries. While you buy from a wider region (you used to be able to specify the state). it can still link together trade and diplomacy (trade improves your relations with another power). A good early game build is some luxury goods. These sell well internationally and you'll get high prices for them. You'll recoup the Private Capital fairly quickly. 1851 - A brief summary after apparently fixing a CTD problem (see tech support). Slavery was still the big issue, but there had been no news on that issue 1851. Even the war talk from Southern radicals had died down a little. Ominously, though, the US continued to build up southern Illinois with a depot and fortifications and increase the fortifications in Washington DC and Ft. Monroe. Meanwhile, there were wars going on all over the world. Russian and Sweden were at war, and Sweden appeared to be winning, having captured Uppsala and Sundsvall. China and the Taiping Heavenly Kingdom were at war, and China had lost Henghzou. The London Times said the people of both Russia and China appeared to be demoralized. And here in the Americas, Mexico was at war with little Guatemala. And at home Virginia was pregnant with their second child. John hoped it would be a boy this time. John lit up a fine cigar from North Carolina and looked out into the night and the future. It had been a good day. Jan. 1, 1856. John W________ again sat on his porch in the evening on his farm in the north Alabama hills, thinking back over the last few years. John was 30 now. His two older children, Bianca, five, and William, three, played on the porch. Virginia sat beside John holding their youngest, Isaac, one. And Virginia was pregnant again. It was nice to have sons, to have a big and growing family. John thought back over the last few eventual years. America had continued to grow, faster than John could have imagined. In his region of Northern Alabama there was now a mineral mine and a railroad connection. Things were good. The economy was booming. Only two questions seemed to hang over the nation. First was the settlement of the West and the Indian question. Second was the ever-present question of slavery. John was interested in all this but wondered what business the US had with Hawaii and Japan. John didn't know how the slavery issue would end, but he thought he could see how the Indian problem would end. The US was acting strongly to develop Washington and Oregon and was pouring colonial actions into Nebraska, Kansas, and Oklahoma. Progress and development were slowly squeezing the Indians. More troops were also ringing the Indian-controlled regions. At the same time, the US was actively seeking better relations with the Apaches and Dakotas. The plan was to win them over as the US had done with the Cherokees, despite occasional conflicts, but to be ready with overwhelming force if another war developed. In the brief Apache War, Cherokee military elements under the US flag had tried to bring Geronimo to battle. One way or another it would happen. The Indians would be assimilated or defeated. Meanwhile the entire world seemed to be at war, according to the London Times. Mexico and Guatamela remained locked in a low-key conflict. China and Taiping had been at war for years. Russia was at war with the Ottomans now, having ended their war with Sweden. Prussia was at war with Belgium and Netherlands. And there was a confusing web of wars involving Austria, Parma, Tuscany, Piedmont, Bavaria, Baden, and Saxony. They all were at war, but instead of one big war, it seemed to be two or three separate wars. As usual, John sat back as night fell and looked out at the stars, but the sky was mostly cloudy, and few stars were visible. Good relations with Britain, Apaches, and Dakotas. Bad relations with no one. Some nations simply don't want to improve relations with me. Overall population satisfaction 80%, though that varies greatly, with the South not highly satisfied but the North almost unanimously satisfied. As for my overall strategy at this point, my colonization policy and policy in dealing with Native American tribes is explained in the narrative. I am playing very carefully with foreign relations and expansion. I took action in Hawaii because it was there and no one else was interested at the moment. It was an experiment in colonization that seems to be going well. All the other areas where I have positive SOI and objectives are now controlled by Spain. Historically the US eventually came into confict with Spain and took what it wanted. But that was much later. So I am in no hurry. I am trying to improve relations with Mexico, but Mexico doesn't like me for some reason. Maybe it is the recent war in which American annexed the Southwest from Mexico, just before the game starts. And I am interested in Panama, though I am not sure what to do. I am continuing to develop industrially, more carefully after my one mistake. I am keeping an eye on research and waiting to see when it starts affecting things. Playing America right now involves running the game and checking messages and then doing economic adjustments and colonial actions about every three months. I could be more aggressive in pursuing the Indians militarily, but I don't want to do that. For now I am quite happy checking messages and spreadsheets. I am just happy I have the economy running without any major problems that aren't self-inflicted and happy that I am making progress in the colonial game. And it if seems like I have a handle on things, I probably don't, even if I'm writing like I know exactly what I'm doing. I'm just waiting on my next mistake like the private capital mistake, or the next conflict or crisis, and of course the Civil War. (1) John is based on my great-great-grandfather. The basic facts I present about his life are accurate, though I'm making up what he thought about politics and slavery and other things, especially at this point in his life, though I have a vague but supportable idea of how he might have thought about things later in life. (2) Pierce actually won the election of 1852 handily. The Whig Party fell apart, and one of the parties that came to power in the aftermath was the anti-slavery Republican Party. So we are in alternative history here. (3) I worked hard on colonial actions there, and all the regions were given a 101 CP when the capital region his 101 and Minnesota was given "American national territory" designation. I don't know what exactly that means. I don't think it is statehood. But for all practical purposes Minnesota is acting like an integral part of the US. Colonial decisions are no longer in effect. So will there be a statehood even or will Minnesota simply stay at 101 for the rest of the game? (4) I just decided to see what would happen with Hawaii, and it proceeded easily and peacefully. This is not historical. The historical annexation took place much later and was resisted to some extent by native Hawaiians. I expected some resistance, but there is none so far. Maybe there is a later scripted rebellion. (5) I found this interesting. Puget Sound reached 101 CP and got a non-national territory designation. The other two regions did not get that designation, unlike Minnesota, where the other two regions suddenly jumped to 101 when the capital region did. They remain colonial regions with CPs in the 60s. (6) I perhaps should have fought the war to the end, but I decided to end it . And I started building more forces in the Northwest, California, and the Midwest for a future war, but I also don't want to be involved in an Indian war when the South secedes. I was surprised when Geronimo showed up in Missouri with his own force and accompanied by a Sioux force. But the Sioux force was apparently neutral. (7) I decided to see what would happen with Japan, and I got an event that triggered when Perry's fleet entered Japanese waters, granting a commercial agreement with Japan. This is pretty much historical, which is why I sent the fleet, to see if it would trigger something. (8) These two were scripted historical events which seemed to have no immediate effect. (9) That was my fault. I carelessly let private capital fall too low to pay all the operating costs at the start of a month, even though I knew I wasn't supposed to do that. I just wasn't paying attention. I learned a lesson. I had to be very patient afterwards and it seems to take a long time to get private capital rising again, but once it did start rising it began to rise quickly. (10) This was a historical event. I thought there might be a small in-game rebellion, but nothing has happened on the map, at least so far. (11) This was another pop-up historical event. I don't know what if any effect it will have. At this point Panama was part of Nicaragua. I am going to attempt to gain closer relations with Nicaragua and see what happens, though I know what happened historically. I took over customs in Panama fairly early and am wondering how this coup might benefit me or if taking over customs has any significant impact at all. (8) the original game design around the civil war used the various historical events to move the country closer to the war. If I recall some of these were meant to allow the player to make an ahistorical choice and thus delay things. My understanding is the more complex model was never put in place leaving a series of fixed steps. The revised civil war design makes use of this by simply scripting it in using a low % chance around the plausible start dates. there is technical issue with the AGE event syntax that you can't use 'or' commands. There are ways around this which involve building criteria and using that. You can see this say in the Crimean war chain where any war between Russia, Britain and Turkey in that period is given the designation 'crimean war'. That designation is then used to control the later events in the chain. But in general this makes branching event chains very hard to manage and very easy to write so they run into the ground. its often hard enough to create an AI variant. All of which is a long way to say there is a lot of chrome around the Civil War in the game but its not really used or something you as a player can interact with. Re your economic management - impressed at your private capital, I'd be tempted to start putting that to use with more infrastructure/industrialisation. You run the risk of a global economic crisis eating a large chunk out of it otherwise - I've just seen a carefully built up horde of PC lost this way. Well, January 1856 rolled around and an economic crisis struck, starting in Japan. And then it spread all over the world including to the US. The immediate result I see is a sudden jump from 1 to 6% inflation. This happened last night just as I was finishing. So I re-read the rule book section on an economic crisis and will now try to handle that. As for private capital, it was real low and stayed low after my economic mistake. And then suddenly it started growing rapidly, and I hesitated to spend much because of my earlier mistake. I was planning on investing a lot of it in infrastructure, as American politicians say, though usually when referring to government funds, early in 1856. Now I'm wondering if it is safe to do so. But I think I should probably still spend it down some. At this point I still can't look at the spreadsheets and see when things like private capital are going to swing one way or the other. Maybe a lot of it is out of control. I am just trying to keep rather stable in commodities on hand and do some buying and selling. As for militancy, it is rising. I see regions from 0 to 53%, with an average of about 20%. The South is more militant, but the North has some militant areas, too. Most regions are content, though two are having demonstrations -- Texas Panhandle and Paducah Kentucky, and one is having strikes -- Northeast Mississippi. I need to try to figure out what is going on in those regions. I know West Texas has been my most unhappy area, maybe from lack of development. There are a lot of interesting little things to consider in the game that I often just gloss over, and I don't know what might have a big effect and what might be safely ignored. About the PC shift, have seen the same in my Russia game. I've gone from gaining 1-200 per turn to around 500 or so. I think there are two underlying reasons. One is the regular population increases that occur - my feeling is this is too permissive (prob v realistic for the USA from immigration but not for the European powers) but its far too late to address such a core feature of the game (and the rules are in the .exe not the events etc). The other is there are a number of techs that boost consumption and the way the game works, people buying goods to live generates PC. A lesser extent is that as economy improves, esp if you industrialise, then people move between the social groups. This is slow but you will have more workers (who consume) than farm labourers and so on. Equally of course, this is international, so more trade means more PC and taxes from international activity. It does balance as you move onto the second generation of production sites they are expensive and that consumes the PC - and then global shortages of coal and manufactures starts to constrain things even more. But with Italy by the late game I didn't bother about PC - I had as much as I needed when I needed it. The constraint was running an economy with the available coal production. I want to thank you for doing this AAR, which is very well written and fascinating. I did want to share the most valuable thing I have learned about raising money in this game, which might be useful. Build luxury factories, set the percentage of luxuries that your people can buy in the F4 screen to maximum, which is eighty percent, and raise the excise tax past sixty percent, or even further. Luxuries are expensive, but in short supply everywhere compared to the demand, and the rich have money. They also seem willing to pay a very high tax for luxuries without getting too upset. Excise tax is a great way to raise government funds, and the more luxuries you sell to your populace, the more funds you will have. Also, the very expense of luxuries will give you more private capital when they are sold in you national market. As you are the US, you will have substantial amounts of gold resources, which you may have run into already. Gold is also a luxury good, and I usually sell all the gold I mine to my own populace, as this also generates more excise tax. Gold is not as valuable as luxury goods, but it is expensive, and will generate both private and government funds. Thanks, Vaalen, for the comments. I will look at the economic advice you have given. And now for another small glitch. I think I will start posting them here rather than on Tech Support or Improve PON. I got a popup showing that James Buchanan had won the 1856 US presidential election in Nov 56. That is historical. But then in March 57 I got a message showing that Winnfield Scott had been elected and inaugurated. Checking F1, it is showing Scott as president. Those who have read my AAR will know that Scott unhistorically won the 1852 election and was inaugurated in 1853. And both the messages I got for that election showed Scott as the winner. 1 - Ignore it. Again, that is fine with me as long as it has no critical later effect. 2 - Fix it. If so, I don't know how. I have noticed the problem with US Presidents being not historical in this era, with some strange election results. As far as I know there is no way to fix it. The developers could do it, if they had the time, but this seems to be a relatively minor problem in its effect on the game as a whole. I have just ignored it when I played the US. The Presidents are in the directory \\Gamedata\Rulers102. so clearly he can come to power at the end of the civil war. Now how the game picks and chooses is not clear. The state attribute liberal democracy in turn enables elections but I think the details below that are in the .exe, Its not in the US event sequences (deaths of Kings etc tend to be). Now this might be connected with the congress files below the named leaders - it looks like each has a 2 year life (which is right?) and if a new President appears with a start date they can be picked. So for Scott my instinct is the 1853 in his data file is wrong. Well, Winnfield Scott is president, and he is also still a counter on the map as my most highly rated general. It is 1858. I have a small rebellion, two regions, and I have put Scott in command of an armed force to put down the rebellion. So for the first time since George Washington led a force to put down the Whiskey Rebellion in 1794 (Washington visited the army sent to put down the rebellion but was not with them long.) we have the President of the United States leading troops in the field. I thought that would be a nice touch. I will write about it in a few days when I finish 1860. As for the discrepancies, particularly one message saying Buchanan had been elected, then another saying Scott had been inaugurated, as long as they cause no issue with the game, I am fine with it. Digging around, I suspect you've stumbled on another not quite completed sub-system. Every other power, even the democracies, seems to have scripted (and historical) changes of President/Prime Minister etc. Some of this maybe too rigid - ie Napoleon III ends in 1870 regardless of whether or not the circumstances that toppled the Second Empire actually occur. Clearly the US has the capacity for a more dynamic model - hence the ahistoric names that can become President at a given pt in the cycle. But this is being controlled outside of player intervention and seems to be aligned to the bi-annual congress system rather than 4 yearly President system. It probably can be overhauled, but would need some careful testing. One option would be to review the list of potential Presidents and make their possible start and end dates align to the real Presidential electoral cycle (or if/when they were assassinated). The other would be to do both this and remove the ahistorical alternative from the list of possible leaders - at least that way the sequence of Presidential leaders will follow the historical track - that would put the US into the same system as all the other powers (and would reflect that the game does not really allow you to directly affect domestic politics)? All in all could be a fun little mod. Especially if a degree of conditionality was built in. You will be presented with a list of candidates 2 months before the actual election. Each candidate will have their own list of electoral attributes that will favor one side or another. For example, a certain candidate may favor war and another peace. When the election takes place, the candidates will have each of their election attributes evaluated and receive a total “fit” value for the position. The one with the higher value will win the election. So, if you are interested in favoring a certain candidate, you have 2 months to try to make them a better fit for the position when you are offered opportunities to affect the election. For example, a populist candidate will benefit from high popular contentment if in office, or from low contentment if attempting to unseat the current ruler, so raising or lowering Contentment may help swing the election. Adding an election information screen is planned for a patch. But I don't recall seeing that list of candidates 2 months before the actual election. I wasn't specifically looking for it, but I do scan through the messages after every turn, though I don't look at every screen between every turn. Maybe I missed something. I am going to look for this next election season, fall 1860. It would indeed be interesting to have a system allowing a little more election interaction. I also wondered what would happen if Scott were killed in the field and yet remained president on the F1 screen. I'm thinking nothing would happen, just assuming there is no connection between Gen. Scott the general and President Scott on the F1 screen. Ah, that fits with my suspicion that is an undeveloped concept and that it all lurks in the .exe. I'd suspect nothing to be honest. You are right that the two entities are separate. You get this with a lot of European rulers who can appear both as a counter and a ruler. Sometimes their military incarnation outlves them - as the routine to clear out retired commands only works every six months. I had this with Italy and sent my zombie Victor Emmanuelle I off to the south till he died rather than have him leading my glorious conquest of Vienna. I also had more than one Garibaldi running around. There is also odd wording regarding the US Congress. The message every two years will say something like "the 36th Congress won the election". But it is really a political party that wins the congressional election. And the Congress ratings plus the president's rating combine in the three rated areas, so there is some importance in the congressional elections. But the message gives me a laugh every time I read it. A more detailed way to do it would be "the Democratic Party gained a majority in the 36th Congress" or something like that. But I'm content with things as they are as long as the game moves along. John talked on his porch in the cold with his father Isaac and a few other prominent men from the county. They had just read the news from northern Virginia -- an armed attempt to incite a slave revolt led by a man from Kansas named John Brown, put down in a battle by an army from Washington, D.C. This, coupled with other events of the year and past year had everyone on edge. There were strikes and demonstrations throughout the nation, but especially in the South. In the South there was open talk now of secession. Alabama was one of the states leading the talk. In the North the new Republican Party, opposed to slavery, was gaining momentum, and it appeared their candidate had a chance at winning the presidential election in November. In North Alabama loyalties were divided. Support for secession (Dixie) was estimated at around 50%, support for the Union at about 25%. Northern Alabama had the least support for Dixie of any region in the state. Alabama would go with secession if it happened. There might be hard decisions ahead. A railroad ran through North Alabama now, making easier to stock the store John and his father ran, and also easier to sell they cotton and other crops they grew. It also made it easier for the men working the mineral quarry to ship their goods. But the last couple of years had been harder, reflecting the economic problems of the entire nation, and it seemed the whole world. The discussion broke up. Isaac and the other men said goodnight. John sat alone on the porch and thought about the past few years and the future. The financial crisis started in Japan. It spread quickly over the entire world. In the US there was scattered unrest in several regions. John didn't know that it would get worse. The Apache Nation surrendered peacefully to and was annexed by the US. New Mexico, Arizona, and Nevada gained colony status. In all 14 regions moved from Apache to US control. As part of the peaceful agreement, an Apache unit under Chief Red Sleeve now served the United States. The entire Southwest was now clear of hostile Indians. Only the Nez Perces in the Northwest and the Dakota on the northern Great Plains remained free of US control. There were demonstrations in North Alabama and several other regions. John disapproved of the demonstrations but understood the concerns and fears the protesters had. In the West, colonial activity continued. Utah and Colorado were granted US colony status Only Idaho, Montana, Dakota (North and South combined), and Wyoming remained in protectorate status. Railroads have moved west into Texas and Kansas. Dissatisfaction was spreading. There were demonstrations in four regions, strikes in five, and a general strike in one. The government desperately began to enact actions to reduce militancy and increase satisfaction. A referendum and plebiscites bill was passed. The US also created a national bank. Troops were sent to subdue social unrest. Strikes and demonstrations continued to occur in several regions. And now a new economic crisis started in France, before the last one had time to run its course. Relations with the Nez Perces and Dakota continued to improve, and by the end of the year they were allies of the US. That still left the question of their ultimate fate an open question. Desperate to lower dissension and militancy, the government took measures to improve the education system. The census and corporate taxes were lowered and then suspended entirely. Yet regions still lost satisfaction, complaining of high taxes. John Brown's raid, along with the other scattered acts of rebellion, had shaken John's confidence in the government to keep things from spinning out of control. John had doubts now if the nation could stay together. It seemed more and more likely that a great fracture might occur, and that the bloodshed might just be starting. John did not want that. But he had made up his mind about one thing. If Alabama seceded from the Union, then John would stand with Alabama. John looked out into the sky for the stars. The night was dark and overcast. There were no stars to be seen. Prestige Points 10,197. Britain 18,087. France 10,967. Russia 8231. (1) As I noted before, John is my real great-great-grandfather. James is my real great-grandfather. Both are buried in northern Alabama. As noted previously, I know a lot of things that John did in his life, but I don't really know how he thought about most things. That part I'm making up. (2) The game doesn't say they are pro-slavery, but "border ruffians" is a term used to describe the pro-slavery combatants in Kansas during the 1850s. The anti-slavery fighters were called "free-staters." (3) The game throws a curve here. Buchanan is elected, according to the message. But the next year Scott is inaugurated, an obvious error. I'm just going to summarize it as the game tells it. Scott is also a US general with a counter on the map. (4) (5) Game messages reflecting historical events. (6) I don't know the nature of these rebels. Are these proto-Confederate secessionists or something else? The game doesn't tell me. (7) States are apparently admitted by event in their historical order. I thought this might happen based on something I read about playing the USA, so I had been developing colonies with an eye on history. Minnesota maintains status as a United States of American National Region, which differentiates it from the original 1850 non-colonial national regions. Game-wise Minnesota has been functioning as a non-colonial part of the US for several years with a CP of 101%. Nothing has changed gamewise. (8) I'm not sure if building oil production sites is a smart thing to do right now, but I decide to do it. Maybe I can sell some of it. (9) All Oregon regions jump to 101% CP. I had the capital region at 100%, with the other two regions lower. Now they are all national territory. I'm wondering if the statehood event would trigger if I didn't pour colonial events into a state or if it would happen anyway. (10) The John Brown event triggers in October, the historical timing. Historically it was put down almost immediately. The historical John Brown's raid consisted of about 19 men and was put down by a company of Virginia militia and a company of US Marines from Washington, D.C. (the only US troops readily available) led by Colonel Robert E. Lee, who had happened to be on leave from his unit in Texas when the raid occurred. The event message came in October, but the rebels show up in the region in December. I'm not sure if they are connected or not, but I assumed for the narrative that they were. And the rebellion in Northern Virginia is just one region away from where Harper's Ferry would have been. (11) At this point I'm not sure how to lower militancy and increase satisfaction. I am enacting every measure possible that says it will do so except any that say inflation will increase. I have suspended some taxes and lowered others while making sure I still have funds flowing in. Perhaps things won't get sorted out until after the apparently inevitable Civil War. Suggestions? Last edited by JWW on Sat Jul 08, 2017 7:06 am, edited 1 time in total. As for reducing strikes, riots, and revolts, usually stationing troops in a region will help, and I think it may help more if the troops are actually in the cities. I am not sure about this, though, as Pocus said it should make no difference if the troops are in the region or in the cities. If I have riots or strikes, I get troops into the area as fast as I can. The higher the police value of the unit, the better it should do at reducing strikes, etc. military police and cavalry have the best police values. But it will take a few weeks or months before it really makes a difference. I think your national contentment is pretty low at fifty eight percent, at this point in time, which may be a reason for all the unrest. I try to get this number into the eighties or better, that seems to really reduce the chance of demonstrations, strikes, revolts, etc. The best way to do this is to satisfy the demand for consumer goods and food. If you are meeting one hundred percent of the demand for food and consumer goods, your contentment should increase rapidly. It will also increase if you can satisfy a high percentage of the demand, but not as fast. It is also better to sell these things to your own people until demand is met, rather than to trade them. It is often possible to buy food through trade, and getting a bigger variety of food also seems to help contentment. Consumer goods like coffee, tea, wine, rum, and others can also be bought, but competition for them can be tough on the world market. As your economy grows and you get more workers and middle class, their demands increase. I think that fulfilling these demands, especially as to food and consumer goods, might be the best thing you can do to increase contentment and avoid further riots and strikes. Lowering militancy is very difficult, and may require some reforms that are not available to you yet, such as abolishing slavery, but you can have high militancy without riots, etc, if your contentment is high enough. to pick up on Vaalen's comments. Goods are in 3 categories - food/common/luxury. Some in each are better than others - so for eg wheat is the best food group, manufactures are a useful common good. Key is you can't fully satisfy demand without a range (so even if you have enough fish alone then they will be short of food) and the wider the range the more people will consume up to their limit. Filling out your core consumption with more esoteric goods is a great strategy. Things that help here are sugar, opium, coffee and tea. Geographically for the US sugar is easier to set up. One way is get relations > 20, a commercial agreement and then you can build your own facility. Or a handy war with Spain to take something that produces lots of sugar etc. Having said all that, I wouldn't worry too much about unrest at the moment. The massive shifts of loyalty and contentment of the Civil War will re-arrange everything so best to focus on the post war outcome. Oil - I wouldn't, at least not this early. There is no demand for it till cars and planes start to appear either for production or consumption. In PoN coal is king. Vaalen, loki, thanks for advice and guidance. I had posted some units in some of the worst regions, but I had not thought to consider police rating. That is one of those things I remember reading.........now that you mention it. And the satisfaction drop was rather sudden, most of it over the last two years. I went from 80 to 58 in four years, but it fell of the cliff in the last two years. I probably should have paid closer attention. I will take a look at sending some units with better police ratings to most affected regions. I do have some cav units created to deal with Indians, though I have hardly used them for that purpose. I have been mainly sending infantry. And I have been trying to buy coffee, tea, opium, and sugar. But I haven't been watching that too closely. But at the same time I'm waiting for the Civil War, and having never played through it, I have no idea what will happen when it starts -- and don't tell me. I want to work through that on my own. The purpose of this entry is to give you an idea of John's life in northern Alabama on the eve of the Civil War and then a short summary of 1860. The 1860 Alabama Census contains detailed information about John and his family. In 1860 John was listed as age 35, his wife Virginia as 31. They had six children, as mentioned in my last summary. The value of his real estate was $3000 and his personal estate $2000. He had moved since 1850, away from his father-in-law, buying land near his father. Possibly they bought land at the same time. John owned 320 acres, 90 of it improved. He owned three horses, four milk cows, seven working oxen, five other cattle, and 12 swine, worth $690. That year or more likely the previous year, his farm produced 15 bushels of wheat, 400 bushels of Indian corn ( a multi-colored corn variant first cultivated by Native Americans, edible by both animals and humans), ten pounds of tobacco, 50 bushels of peas and beans, seven cotton bales of 400 pounds each, 75 pounds of butter, and 20 pounds of honey. John is listed as owning one slave. I do not know if the slave was male or female or a house servant or farm worker. There is also another 47-year-old male living on the farm. Since he is listed by name with the family he was apparently a white male. He is listed as a farmer. It is likely he was a tenant farmer or a farmer otherwise employed by John. This is apparently not the slave though I am not 100% certain. John's father Isaac owned a nearby smaller farm. In addition to most of the things John's farm produced, Isaac had 16 sheep and produced 25 gallons of molasses. The variety may surprise you, but they did not live in the cotton plantation region. They lived in hilly country that did not lend itself to large scale plantation farming. Thus there were fewer slaves, smaller farms, greater variety, and less Confederate sentiment. Enough with the real world of 1860. On to the AAR. In my game, 1860 was mainly about marking time and dealing with the economy. In January Congress approved new measures to improve the education system and increase social protection to reduce growing unrest. Troops were sent to areas with high unrest. Congress rejected road and sewer improvement measures but approved a drainage project. National satisfaction stabilized at 58-60% until October. In October another economic crisis struck, this one beginning in Russia. Inflation temporarily jumped from zero to five percent. And satisfaction suddenly dropped five percent. Inflation quickly recovered but satisfaction didn't. Actual militancy -- demonstrations, protests, destroyed goods, general strikes -- seemed to lessen with troops present. I eagerly awaited the 1860 election in November to see if Lincoln would win and the secession sequence would start. But I never got a message on the election. I assume we will see a new president inaugurated in March. But I will have to wait and see. Historically the election of Lincoln led to the start of secession, with South Carolina seceding first in December. In the game, this did not happen. EDIT -- I got a popup after the early January 1861 turn explaining the election and that Lincoln had won. It described the election as it happened in history. Of course I will now have to see if he gets inaugurated in March or someone else, as happened to me in 1856. I have US troop units in about a dozen regions in the South to lower unrest. I am wondering what will happen to those units if and when the Civil War begins. Meanwhile I continued to tweak the economy, including making a better and more successful effort to buy a variety of goods on the world market. I continued to build railroads but stopped creating new factories or production sites of any kind. I continued to improve relations with the Nez Perces and Dakota Indians. The federal government also continued to improve the defenses of Washington, D.C., and Norfolk, VA, and to continue to improve its position in the southernmost portion of Illinois, with plans to use it as an assembly point for an offensive against the Confederacy. This of course is not historical, but since I know the Civil War is supposed to happen, it makes sense. Of course another way to play would be to make no such pre-emptive plans, that is to role-play the history, but there are a couple of warnings I've read to make sure to not lose Washington to the Confederacy, so I decided to fortify and reinforce. On another game note, I was getting incorrect updates every year on two of my three missions from 1850, but at the end of ten years I got reports that correctly identified all three missions. I succeeded on one and failed on two. But I wasn't really paying attention to them. I just wanted to report that despite the incorrect reports every year identifying the wrong missions, the final report was correct. So on to 1861. I will give a short report when I see the 1860 election results or the Civil War starts. Last edited by JWW on Mon Jul 10, 2017 1:47 am, edited 1 time in total. A brief note. Early May 1861, the Civil War is here, announced with a series of popups. Lincoln is indeed president of the USA. The map has been reset somewhat like the start of the Civil War scenario but with existing units with some reinforcements. I haven't examined anything closely. I will submit my next AAR report after the war is over.